As we have found out over the last few years, Shropshire is a wonderful county for a holiday. There's great walking and you can explore castles, ruins and stately homes to your heart's content. The geologically minded will love collecting fossils and minerals. And if it's tasty food you're after... well, Shropshire has a reputation for that. For an area that has seen so much strife and bloodshed over the centuries, Shropshire has that picturesque vibe down to an art. Tiny villages with half-timbered houses, small towns with intriguing buildings, indie shops and artisan boutiques, and larger towns with all of these plus all the amenities like cinemas and shopping centres make this a county that's a joy to explore. Exploring is best done from a base, whether that be a hotel, guest house, campsite or a holiday cottage. Shropshire has a raft of holiday cottages available to rent for a weekend, short break or longer. They're well equipped, well looked after and are very often a true home from home. During our last Shropshire holiday we stayed at The Granary in Stapleton, just a few miles south of Shrewsbury. It was a superbly equipped cottage - billiards anyone? - and a wonderful place to spend a week. If our exploration list hadn't been a lengthy one, we could have easily stayed there for the week, gone for walks straight from the door and played table tennis, noughts and crosses or table football in the barn! Shropshire cottages come in all shapes and sizes and below I've picked a small selection of cottages for you to get started finding your perfect holiday retreat. From cosy, romantic hideaways for two to larger properties that can accommodate your whole family, from tiny villages like Stapleton to holiday bases in the larger Shropshire towns like Ludlow and Shrewsbury and much in between... I hope I have found something for everyone to take a look. Once you've booked one of the many holiday cottages in Shropshire for your break, why not check out the other Shropshire pages on our site for ideas what to see and do? 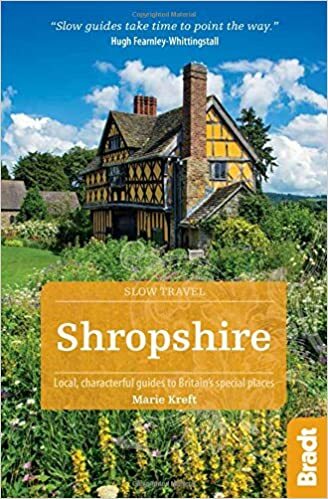 You could visit Shrewsbury and Shrewsbury Abbey, explore Much Wenlock or Ironbridge Gorge, visit Moreton Corbet Castle or get lost in the Broseley Jitties. There's Lilleshaw Abbey, or Wroxeter Roman City for those who love ruins. There's Snailbeach Mine and grandiose walking around the Stiperstones if you love the great outdoors. And, of course, there's wonderful food of every description... you're in Shropshire after all! And you can find a summary of all of Shropshire's delights on our Shropshire page!